MATT GARVEY: We are joined by University of Virginia head coach Mike London, wide receiver Kris Burd, and Steve Greer. Coach, if you could make an opening statement and talk about your bowl experience thus far. COACH MIKE LONDON: First of all, obviously we see why the Chick-fil-A Bowl has been one of those bowls that has been very coveted and gracious in what they do for the players and the coaches, the community. We’ve experienced that the last couple days we’ve been here. You can ask these guys. They’ve had fun. They’ve enjoyed the events. There’s still more to do. It’s been a neat experience. We know there’s a game that’s got to be played. Through practicing and preparing, that’s what we’ve been doing, juggling all the things required when you have an opportunity to be at a bowl game like this. A very rewarding experience thus far and we’re looking forward to the rest of the week and into the game Saturday. MATT GARVEY: Kris, we were talking about the Battle For Bowl Week competitions. Talk about what that’s been like. KRIS BURD: Before I answer that, I just want to thank the Chick-fil-A Bowl. They’ve definitely gone out of their way to make us feel special as a team. All the events we’ve been to so far, the team has had a great time. I’ve thankful to be here and it’s an honor. 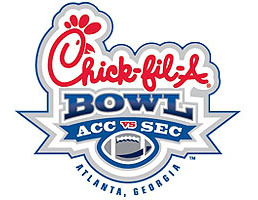 The Battle For Bowl Week, some competition between Virginia and Auburn. The first day me, Chase and Ray Keys, we had a shooting competition, basketball shooting competition. We won that one by one. Last night we had a buffet thing. We won that one, too. So right now we’re two up. We’re looking to get a clean sweep. MATT GARVEY: Won it going away. You set the all-time record for the Brazilian buffet. No team has eaten the amount of food you ate. So I guess congratulations (laughter). COACH MIKE LONDON: After we went back, LaRoy Reynolds went straight to the trainer and ask for a Roll-Aids. MATT GARVEY: We’re going to actually have the weight in pounds of that early this afternoon, so we’ll let you know. Steve, what do you think is going to be your favorite competition this week? STEVE GREER: So far last night was just a blast. All the guys had fun. We all like working with each other, feeding off each other, we wanted to get that win. Last night was a lot of fun and really good food. MATT GARVEY: We’ll go ahead and open it up for questions. Q. Can you discuss what the football portion of the week is looking like and what the practices have been like so far. I guess you had one yesterday. COACH MIKE LONDON: We’ve had an opportunity to get out and go to the dome. Today we’ll go to Georgia Tech, utilize their facilities there. They’ve been very productive practices, practices that we’ve had back in Charlottesville. There’s a lot of preparation when you don’t play for another month. We’ve done a lot of things. Basically a lot of it’s going over what we’ve done, short yardage, goal line, kind of get ourselves with the guys having Friday, Saturday, Sunday, traveling down here Monday, getting acclimated back to playing football again. Yesterday was a good practice. I expect today will be another good practice. Q. Coach London, academically you put a bunch of emphasis on that. As a result, it seems like everyone is down here for academics. I was told one player didn’t make it, not for academics, it was a coach’s decision. Can you tell us that player and the reason why? COACH MIKE LONDON: It’s tough enough for the young man not to make it on the trip. I’ll keep the reasons why personal between myself and him. But there are expectations I have of these guys in the classroom, not only university standards but NCAA standards. Those are some of the things if we’re going to be in bowl games hopefully for years to come that as you’re playing through the season, one of the things that’s a motivating tool for these guys is that post-season opportunities are still going to be contingent upon their performance in the classroom. As the season goes on, you don’t stop going to your classes, you make the required GPAs set for you. Hopefully everyone understands for things that come with the program, also there’s a measured amount of responsibility for handling your academics. Q. Can you reveal the player’s name? COACH MIKE LONDON: I’d rather not. Like I said, it’s tough enough as it is for a young man to be without his teammates. Hopefully it’s an example that the rest of the players, particularly the younger players, will understand their obligations on the field are noted but also off the field in the classroom. Q. The fact that Auburn is going into this game without their defensive coordinator, without their leading tailback, how has that made the preparation for you? Tricky at all? COACH MIKE LONDON: Coach Chizik made his fame in being a terrific defensive coordinator. He probably feels the same way, your team is a reflection of you, your personality. Whether the former defensive coordinator is here or not, the defense reflects Coach Chizik’s personality. He has had a defensive coordinator background. I’m not sure there’s going to be a lull or drop-off in his play-calling abilities. You look at it from the standpoint of getting prepared for what we’ve seen them do. When you have a month to prepare, undoubtedly you’re going to see some things you haven’t prepared for, some looks you may not have prepared for. But you hope that the accumulation of all the reps, all the things you’ve done through the season for the one, two, three, six plays that, ay occur during the game, you rely on your instincts. It’s not as much getting prepared for their situation, they’re missing a runningback, they had the number one recruiting class in the country last year. The young men, the runningbacks for them are accomplished, McCalebb is a special teams dynamic player. When you watch him play, Dyer is special, but you look at this young man also, he’s got the skills, too. I know they may think there’s maybe some drop-off, but when you look at tape, how well all of them play, how dynamic they are, for us it’s not a drop-off, it’s still being prepared. Q. Nick Jenkins, has he become the player in college that you hoped he would be when you saw him in high school? COACH MIKE LONDON: I think more than just becoming the player, he’s become the young man that you aspire all young men to come to college, get an education, be influenced by all that they’re surrounded by. Nick was brought in a 3-4 defense as a two-gap nose tackle and has done a great job the last two years making the transition to playing a shaded technique on the edge. Along the way what you always hope for is they become mature, they make good decisions, they make decisions that the four years, five years of his existence, you look back and say, I’m proud of that guy. I started out recruiting him, been in his home, all that. It is nice to see a guy graduate, become a captain, two-year captain. Just one of those things you appreciate what you brought to the program. Kris being a fifth-year guy, he was one of the redshirt freshmen that went to the Gator Bowl with us. Although he didn’t know about that experience because he wasn’t playing, but now values the experience that he’s going through because he is playing, and he hopefully leaves a legacy for some of these younger guys to follow. Q. Can you talk about the different nuances you had practicing in the dome, practicing in a dome for the first time this year as opposed to practicing outdoors? COACH MIKE LONDON: I’ll just say quickly, and the guys can answer, Kris is a receiver, he catches the ball. Obviously there’s a depth issue because of the ceiling, things like that. There’s a noise issue where you have to get acclimated to sounds. We tried to turn up some music yesterday. I don’t know if you can mimic a sold-out dome crowd, but you try to do some things to bring that noise about. We caught punts, kickoffs. Again, Kris can talk about the depth perception, tracking the ball, things like that. But, you know, it’s football, indoor, outdoor. The weather is guaranteed in this game. That’s something we’re excited about. But we talk about spotting the ball in the parking lot, where you want to put the ball down, put it down and lets play. I’ll let these guys talk about the particulars of it. KRIS BURD: Playing in a dome is definitely a little bit different than playing outside. From a receiver standpoint, you’re throwing a deep ball, you’re not looking up at the sky judging it, you’re looking at a ceiling. It’s a lot different. You have lights a little bit lower. At the end of the day, it’s still football, though. I approach it the same way I would if we were playing outside, if we was playing in the street. Me, personally, as a young player, little league, growing up, playing in a dome was always something I wanted to do. Being able to have an opportunity to play here in Atlanta in the Georgia Dome definitely means a lot to me. I’m looking at going out and showing off. STEVE GREER: Kind along the same lines. You have the ceiling, the lights. You have to kind of make adjustments for that. Like coach and Kris said, big picture, we want to be the type of team once we see white lines, we want to be ready to go. Q. Coach, Bill Lazor, when you started here and hired him, what was it about him that made you want him leading the offense? Speak about his experience as well. COACH MIKE LONDON: With all the coaches, particularly Bill since you’re asking about him, I never worked with him, but I worked with guys that worked with him and knew him. Bill Musgrave, just different people, Pete Mangurian, some guys in the NFL, some guys that have been in college. When I was here before at Virginia, part of the offense was an I-pro multiple formation attack, being able to run the ball and also being able to throw the ball. I think philosophically when we had a chance to talk, that was something that was very appealing. The prospect of coming back to college at a place like Virginia, a great place like Charlottesville to live in was something that I think was appealing to him. It was two years in the making. We’re hoping we continue to get better as an offense, keep having receivers like this guy who can catch the ball. You throw it up, he can go get it. The style of offense is very compatible to when I was a young coach, being exposed to coaches, watching how teams have success is what I wanted to have as a head coach, and Bill had an opportunity. Q. Coach London, Auburn, are they similar to an ACC team that you have faced this year? COACH MIKE LONDON: I remember answering that question a couple weeks ago about athletically skill-wise, kind of remind you of a long, athletic Florida State team. You look at them run and play, they got young players that are very skilled, very athletic, very long. Defensive ends, DBs. Again, last year’s national champions. I know people talk about how many losses they have, but you look at who they lost to. You look at a team that’s very athletic and poses threats, one-play threats. The kicking game, they return punts and kickoff returns for touchdowns. Their style of offense is an offense that if you’re not reading the keys correctly they throw the ball behind you. They have defenders that are big-play defenders that can rush off the edge, corners that will get in your face and try to jam you at the line of scrimmage. I know they’re young, like we are, but they’re a complete team because they’ve been on the stage before. Q. Coach, did you have the option to practice more here and chose to practice at Tech? COACH MIKE LONDON: No, the options were basically up to us, just as long as it didn’t conflict with what Auburn was doing. I wanted to be able to for selfish reasons be outside at the Georgia Tech facility because their facility is the model of what our indoor is going to look like. Our indoor is going to be 100 plus yards, we’re going to make some additions and things like that that our leadership has looked at and said, Let’s build it the way we can and make sure it’s very functional. Having an opportunity today to practice there for two reasons: one, to get acclimated, see what our place will look like in the future, but also when you have two different fields like they have, then you give your offense a chance to go 100 yards, your defense a chance to go 85 yards, as opposed to the dome. You want to go in there, as the guys talk about, to get acclimated to the sounds, the lighting. The field is 100 yards, you have to split it up, you still have offense and defense. We’ll practice at Georgia Tech today, we’ll go to the dome tomorrow and Friday, and that will be it. Q. Coach Chizik says one of the things about your offense, he hadn’t seen much about it this year. For the fan who is new to football or doesn’t understand terminology, what are the things that make your offense so unique? COACH MIKE LONDON: I’m going to let Kris talk about that because he’s been the benefactor of that, last year for over 50 catches, this year with multiple catches. I think having a guy like Perry Jones that can run the ball, you can also use coming out of the backfield, having receivers like Kris and a couple other guys that thrive on a passing game that deals with throwing to spots, not particularly throwing this route or that route. These guys do a great job of running routes. Then the running game that keeps everything in balance for us. I’ll let Kris answer about what the offense has meant to him. KRIS BURD: Well, starting off, Bill Lazor is definitely a great coach. I feel like when it comes to football, he’s kind of a mastermind. Each week we go in with a new opponent, he had a new scheme to attack some of the weaknesses he sees. All of the credit goes to him drawing up the things that get our personnel in the right places and put us in positions where we can thrive. I feel like a lot of guys have bought in and know their role on offense. It’s not really any confusion as far as who’s that guy or who needs to do that. We really just take pride in doing whatever it takes to win. This week I’m pretty sure, because they have something drawn up that can attack Auburn’s weakness on defense. I’m looking forward to that. COACH MIKE LONDON: The question was asked specifically about Bill and the offense. Particularly this season a lot of the success was on our defense also with Jim Reid and the leadership there as far as the way our defense actually really improved in a lot of measurable ways, run defense, points scored against, passing efficiency, passing defense. You talked about the Bill Lazor-type of philosophy. Coach Reid and I have been together before. I believe defense wins championships. I think defense, it can be a mainstay in a program. I think he and the defensive coaches have done an outstanding job of kind of bringing this things back and getting guys like Steve Greer to play and be very successful in it. I think it’s a team effort. Anthony Poindexter, our special teams coordinator. A lot of improvement has been made in all three areas for us when you look at statistics. I know whatever can be measured, you can use that as an achievement or something that you have to continue to work on. I think this year was a year there was a lot of achievement made in a lot of areas. As you get older as a football team, we’ll get better hopefully. Q. Coach, you won a national title at Richmond. You’re here in a bowl game. Are the situations or experiences similar? Do you draw on those days when you won the national title? COACH MIKE LONDON: In the FCS there’s a series of games that you play to get you to the final game. It was always the journey, playing Appalachia State, Northern Iowa, winning those games on the road. When you have an opportunity to play in a big game like this, I want more for the players to have the experience of the journey of what the season meant to us, and the culmination of it is this game. In the FCS it was the last game. We were fortunate enough to win the national championship. This is Kris’ last college game. Through the course of the season, this is now the most important game because it’s the last game for him and a lot of his teammates. What you want, what you’ve experienced, you wish it on guys like him, but they only go through it once they go through it. So hopefully he’s enjoying the experience. Q. To kind of circle back to some of the experience of this whole week, what are some of the benefits of the bowl week and the activities and the opportunities that are here? How is that different than when y’all fly in and fly out for a road game? COACH MIKE LONDON: I think the philosophy of the Chick-fil-A Bowl in terms of the community outreach, in terms of their personal commitment to developing not only mind, body and spirit, these guys have an opportunity. Yesterday we were at the MLK Center and talked to Congressman Lewis. When you find out different things of that day when the I Have A Dream speech was made, he’s the only one left of those 10 speakers living. I think these guys appreciate something like that. We’ll have the chance to go to Children’s Hospital here tomorrow. When you go in play a game, you go in Friday, have your meetings, you wake up Saturday and play the game. When you come down here, they’ve done a great job of spreading things out that attach a meaning to the community. I think these guys have a better appreciation. Today was the SEA breakfast. Charlie Ward was a speaker, along with several other speakers. I think what it does is not only feed the mind, body, soul and spirit, you can ask these guys about the experience, I think it’s something they’ll remember for a long time. KRIS BURD: I mean, going off what Coach London said, just the experience as a whole, when we go in at a regular road game, we fly in Friday, we got meetings, it’s all business, go to the game and we fly right back out after the game. I feel like bowl games, you really are more thankful, one, because you’re bringing the whole team, everybody who is a part, scout team players who have been giving you looks all week, they get a chance to see what it’s like to travel, to see some of the things you get to see. The opportunities and events we’ve been to, I’m thankful. Like he was saying, we went to the church where Martin Luther King grew up in, got to hear some speakers. It’s just a remarkable thing that I’m in this opportunity to share with some of my teammates I’ve been around so long. I’m just thankful. Looking forward, going to bowl games like this, I can feel the team getting stronger because we have a lot more memories now to really draw back on. It’s one of the things that brings the team closer. STEVE GREER: Along the same lines, most of the road trips we see the inside of the hotel. It’s been a great experience to see the city. Like Coach London and Kris said, the Chick-fil-A Bowl has done a great job with things like the Martin Luther King visit and things like that. I agree with what Kris said, I think the unity of our team keeps getting stronger with the things we do, just having fun together and keeping our brotherhood going. Q. With everything else going on around you this week, the fact that it is now game week, it’s a normal game week, you’re playing on Saturday, how much does that help you focus in now that you’re here? COACH MIKE LONDON: I think we’ve always been focused. I think, again, the finality of Saturday looming is something that’s coming to the mindset of a lot of these guys. I’ll use Kris as an example or Nick Jenkins, our fifth-year seniors, this is it. Everything they do is going to be the last that they do. The last practice we had in Charlottesville, a lot of the guys got carried off the field because it was the last practice. You want to enjoy your college experience because a lot of these guys will be in your wedding, they’ll be your best man, they’re that close. So this is another opportunity with a game, after the game, the experience, they’ll always be able to share. The finality of it is coming to a head here with Saturday a couple days away. Q. Steve, Nick was telling me earlier that Coach Reid, one of his sayings that gets you motivated, he compares it to like you’re an FBI, special forces kind of deal, in and out. Can you elaborate on that. STEVE GREER: He compares road trips to a special force mission where you get in, do the job, get out, like the SEALs are a special forces. Same mentality we have, get in and get the job done. KRIS BURD: I mean, us as the offense, we don’t go on the special forces mission, but we have the same type of attitude. When we go on the road, it’s a business trip. We just got to execute. Our goal on offense is to score more points than the defense. Greer and our defense has played so well this year, the job has been kind of easy for us. Our job is to score more points, and we scored enough points to get us to the Chick-fil-A Bowl. Q. We read about Coach London’s postgame talks, speeches. What are they like? What does he do? KRIS BURD: I’m sure you can tell already, Coach London is a very electric guy. After wins, we get in the locker room and for better or worse we party. I’ve been around in the good. We went to the Gator Bowl the first year. I’ve been around for the bad years we’ve had. Wins aren’t easy to come by, especially in a conference like the ACC. Coach London came in and rejuvenated things around here, got the community behind us again. For us to see how far we’ve came, we definitely party and celebrate in the locker room after the games. Coach London is passionate about his job and we’re very passionate about him. With us being passionate as a group, it leads to a lot of wins. STEVE GREER: Coach London’s passion is evident in everything he does. You talk about football, the speeches he gives for that. Also other stuff, like the classroom, he’s passionate and energized about everything. That translates how the players view everything we do, games, strength training. I think his passion helps us focus on what we need to do to be successful as players and young men. COACH MIKE LONDON: You guys are excused from practice (laughter). MATT GARVEY: Thank you so much for your time, gentlemen.